As we thought about making 3 dimensional structure some questions arised. What kind of structures are possible? What kind of structures exist in nautre? How does a structure interact with a particular room situation? What is the intention? What features should a structure have and can we bring it to life using an audio/visual performance? After a lot of research and discussions we found the Weaire-Phelan structure most impressive and started to explore that – the hour of birth of TENSOR. The aim of the artwork is to deal with tensions in experimental form. Tensions between space and object, object and module, material and structure, surface and medium, image and sound, reality and illusion as well as between the piece of art and its beholder are at the center of attention. Because of the highly complex field of work, a cooperation with artists and designers from different fields was needed – Neon Golden, Franz Piffl (industrial design), Atelier Alexa (jewelery design), Audiodevice (sound) and Iftom (mounting) all lent us their helping hands (and minds) in putting this together. 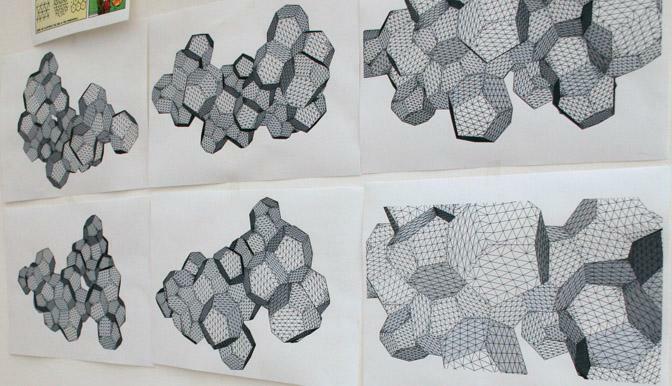 First experiments to create a sculpture, following the rules of the structure. We made several visualizations of the sculpture to get an idea how it appears and takes effect in a location. After the production process we get single objects which can be built together in several formations. The projection fits like a second skin on the sculpture. Modern projection technology called “mapping” makes this possible. 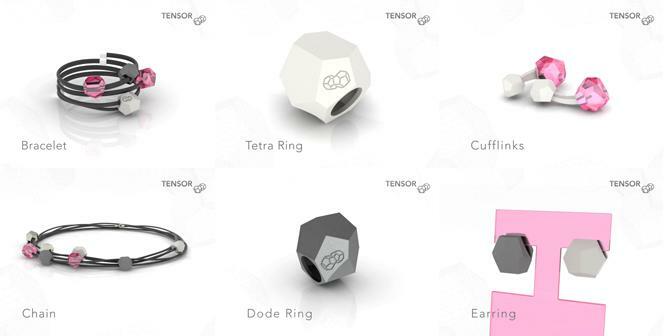 Renderings of the TENSOR jewelery collection by Atelier Alexa.